In November 2013 it was announced that part of the student loan book was being privatised. 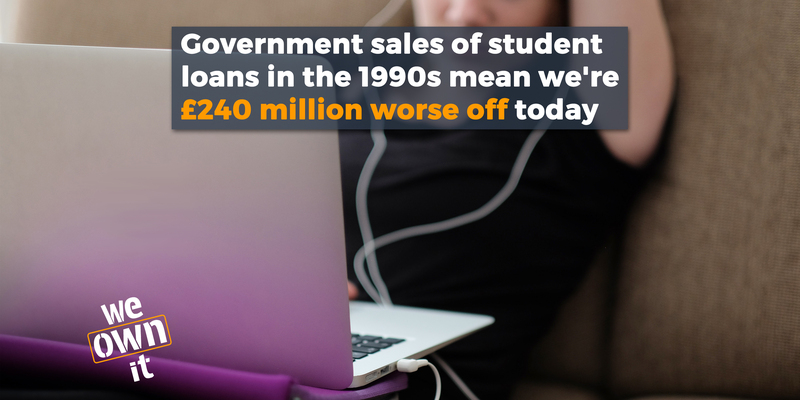 £900 million worth of student loans made between 1990 and 1998 were sold off. The loans were sold to Erudio, a company which has been criticised since for its handling of the debts. The coalition government planned to sell off student loans made between 1998 and 2012 as well, but Vince Cable decided to abandon the sell-off plans in July 2014 - so these loans are still in public hands. In February 2017, the anouncement came that the sell-off was back on. Jo Johnson, then the universities minister, announced that he would resume the sell off of loans made before 2012, starting with the group that started to be paid back between 2002 and 2006. Osborne originally promised that the proceeds from the sale would go to fund higher education. But Johnson made no such promise, and ministers said that the money would go to 'other policies with greater economic or social returns' than universities. The sale was postponed because of the 2017 General Election, but it was confirmed in October 2017 that the sale will go ahead. What the sell off means for students, and anyone who has graduated in the last 15 years, is that interest rates could rise (although the government has ruled this out – it is not inconceivable). This would force graduates to pay more back - despite lower wages and lower job prospects for many. In addition, we are all likely to lose out in the long term, because of the terms and conditions of the expected sell off (if the sale of older student loans are anything to go by). Clauses are introduced that mean there's little risk to the companies involved, while the public is forced to compensate the buyers of the loans if repayments are lower than expected. The value of student loans in the future will always be higher to the government than it would be to any potential buyer, which means that students loans are less valuable to private investors than to the government - they will not pay what the loans are worth to the government. The sale makes no economic sense, and it means that future governments will have much less scope to reduce the burden of debt on students in the future, by cancelling outstanding debt or improving the terms and conditions of existing loans. 64% of us want the student loan book to be in public ownership (Survation, 2015). Photo used under Creative Commons licensing, thanks to Brunel University.